The field encompasses drug composition and properties, synthesis and drug design, molecular and cellular mechanisms, organ/systems mechanisms, signal transduction / cellular communication, molecular diagnostics, interactions, toxicology, chemical biology, therapy and medical applications and antipathogenic capabilities. The two main areas of Pharmacology are Pharmacodynamics and Pharmacokinetics. The former studies the effects of the drug on biological systems, and the latter the effects of biological systems on the drug. In broad terms, Pharmacodynamics discusses the chemicals with biological receptors, and pharmacokinetics discusses the absorption, distribution, metabolism, and excretion (ADME) of chemicals from the biological systems. Pharmacology is not synonymous with pharmacy and the two terms are frequently confused. Pharmacology, a biomedical science, deals with the research, discovery, and characterization of chemicals which show biological effects and the elucidation of cellular and organismal function in relation to these chemicals according to Wikipedia. 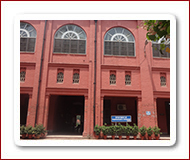 The major academic objectives of the Department are to facilitate Basic and Applied Research, educate under graduate, graduate and professional students in various disciplines and provide academic excellence.The Department is engaged in teaching all the subjects related to Pharmacology and Toxicology to the undergraduate and postgraduate students. The department offers postgraduate courses leading to M.Phil. and Ph.D. Degree Programs. The research activities have been focused on problems of practical importance related to drug disposition and pharmacokinetics in different animal species under local environmental conditions, macro and micro minerals estimation in animals and by-products, drugs residue studies in food animals, pharmaceutical, plant and chemical toxicity studies and effect of drugs, plants and toxicants using various experimental models. The studies are also carried out for evaluation of indigenous medicinal plants. The outcomes of the research projects have been published in many peer reviewed international research journals. Our mission is to provide quality preclinical and clinical education in pharmacology and toxicology for students, to educate and train graduate and postdoctoral biomedical scientists, to carry out basic research. All the staff in the department is involved in teaching and research activities with zeal and zest. Perform various administrative and extra curricular activities. Arrange study tours for the students for better understanding. Organize workshops, seminars, hand on trainings and national and international conferences. Actively and regularly arrange students in various tutorial activities. Revision of Practical Manuals named "General Pharmacology and Toxicology" and "Systemic Pharmacology and Therapeutics". Up gradation of the undergraduate lab. with new instruments. Renovation and up gradation of Postgraduate laboratories with new equipments. Lectures are made on Power Point Presentations and animations by using multi media aids for better learning. Drug dosage development/adjustment studies/therapeutic trials of modern drugs. Study of Plants/Chemical intoxications in domestic/lab. animals. Development of new Drugs from natural /unconventional sources. Bioavailability study of different drugs used in poultry/other domestic and lab. animals. The faculty aspires to be at the top of the leading national universities, excelling in teaching, learning, research, innovation and public service. To provide students with the knowledge, skills and experiences necessary to become leaders in a world of rapid change. To generate a community of scholars who are cooperative, collegial and committed to mentoring and inclusion.